Describe an item of clothing you wear now that someday your son or daughter will want to own. What is it, and why will your child want to wear it in twenty years? She sits in a cosy armchair by the crackling fire, nose deep in a hefty book. Her mother watches her from across the room, a tender expression on her face. Her forehead furrows for a second, before relaxing as she smiles to herself. 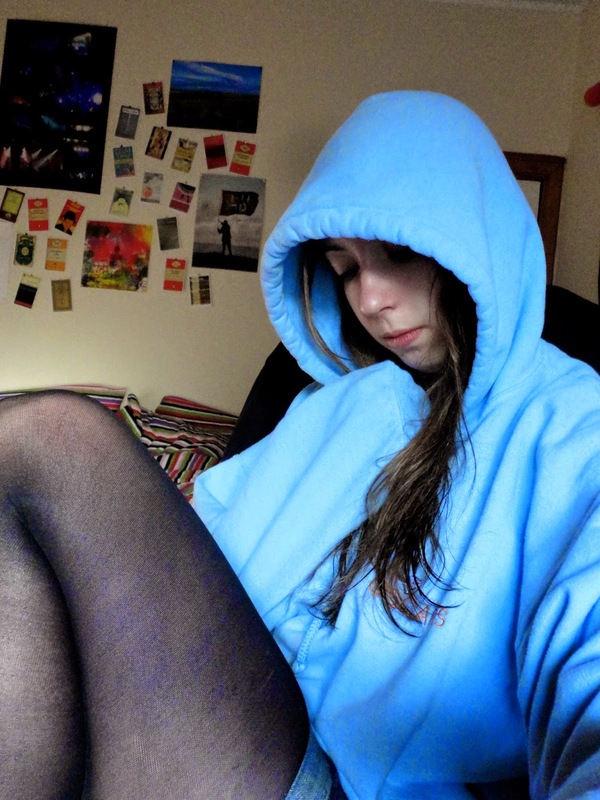 Her daughter is lost in the folds of an over-sized blue hoodie; one she recognises well. It used to be hers. The thick fibres are warm and enveloping, imbued with the scent of washing powder. It is clearly a well worn item now, after years of use, the softness of the original lining now rough after years of use. The ends of the sleeves are ragged, from where they were dragged down over wrists and fidgeted with continually. The strings from the hood are twisted and chewed at the ends, and a few faded stains remain on the front, where food was dropped on it. It is blatantly too big for the girl, as it always was on her mother too. It is a simple item, plain blue with a small logo on the breast. It was once part of the uniform for a summer job, worn two years in a row and kept afterwards. It is not stylish or fashionable in any way; but it is warm and comfortable and practical. It was protection from the elements, a pillow on long bus trips, an extra layer in bed during the freezing winter months in student flats. It stayed with her beyond the summer job, and while it was never a particularly special or favourite item of clothing, it somehow stuck around for a long time. It travelled with her and was around for many key moments, even if only shoved in a bag or flung over the back of a chair. And now here it was, enveloping her daughter now. She can only presume that it was pulled from her bottom drawer in the hunt for an extra layer of warmth. Or perhaps, as a source of comfort during the times when she had to travel for work. It seemed to make sense that she had it now though. Sturdy and practical, and had somehow become entrenched in memories without her really realising. It was her, by accident, unintentionally soaking up her life, and now here it was, clothing the most important part of it all. Nice post ! Custom Hoodies are available in different designs and color combinations to choose from., then custom hoodies can be an excellent idea to play around with. These are very much popular among teens and adult. This is because it adds a personal touch to it.Jackets never go out of fashion not only in India but in many other countries and they work everywhere. You can even design your own custom hoodies too. You can wear a customized hoodies with jeans, skirts, shorts or any type of outfit you like. You can purchase an customized hoodie from an online store.